You want to take a trip. You’re pregnant. Or you might be pregnant by then. Does that mean you can’t plan any travel? No! Plan away! But it’s time to learn about travel insurance. This post is meant to cover the following situation: I will be pregnant or may be pregnant during the trip. I want to take the trip, but what if something happens healthwise before or I just don’t feel like taking the trip? On the other hand, I may be fine so I want to plan on going unless something happens. This post is not meant to cover insurance to help if something happens to you while you are on the trip pregnancy-wise. There are policies out there that cover this, but I do not have personal experience with them. Keep in mind that for many insurance policies it matters whether or not you were pregnant at the time you bought the policy. 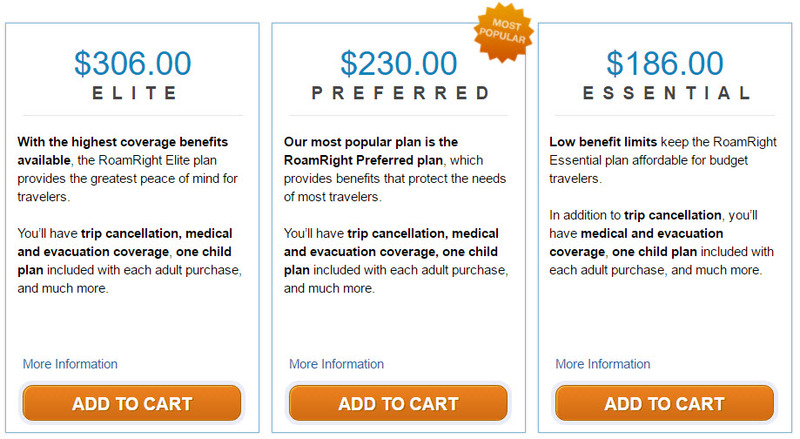 Travel insurance sounds scary, but it can be a really useful tool. It can be a bit tricky buying the right policy but it can be done! “Cancel for Any Reason” coverage means you can cancel the trip for any reason. It’s more expensive than other travel insurance policies since it covers more, but it can protect you if you can’t or don’t want to travel when the time comes. Most other policies may not cover you if you knew you were pregnant when you bought the policy or want to cancel the trip because you became pregnant. 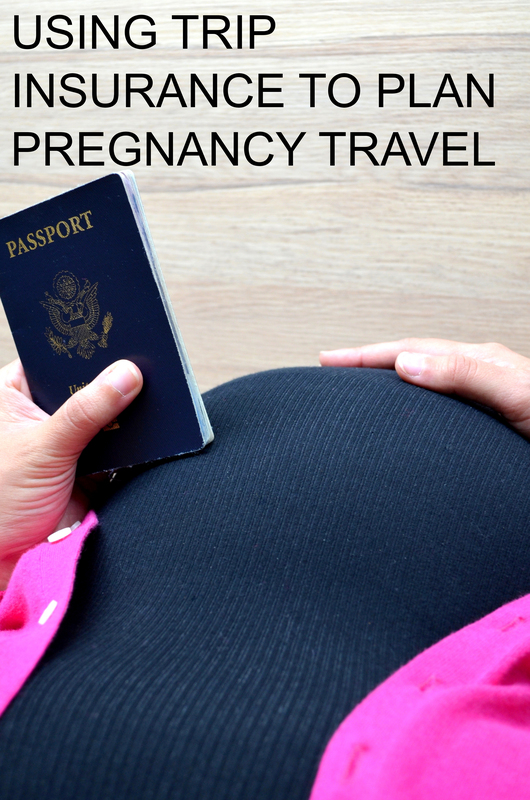 Make sure the policy you are looking at is “Cancel for Any Reason” not just generic “Trip Cancellation.” Pregnancy and childbirth are very often exceptions to general trip cancellation policies. Here’s the kicker: you have to act fast. Once you make a purchase toward the trip, the clock starts. This means a deposit, that first hotel reservation, plane tickets, whatever it is where you are spending actual money on the trip. Each travel insurance company has different deadlines. The most common I’ve seen is 14-21 days from the “date of first deposit” or the date you first buy something. The longest I’ve seen is 30 days. Do not miss this deadline. I missed the 21-day deadline by hours for my trip to London because I did the math wrong. I had to go with a company that had a 30-day window and it was more expensive. Lots of factors go into this including the age of the traveler and cost of the trip. The good news is that most sites will give you a free quote once you punch in the details. Here’s an example using RoamRight, which who I tend to use. RoamRight is not paying me to post this and I’m not suggesting you go with them. This is just an example! On the homepage, enter in the details for your trip. Below is an example for a trip for 2 with $5000 in nonrefundable costs. Three quotes are returned. I usually go with Preferred because I have credit card and other insurance that covers other items I need. I never buy Essential because it does not have an option for the Cancel for Any Reason upgrade. Note the prices quoted do not include the Cancel for Any Reason upgrade. You have to click down and see the additional cost to add it. 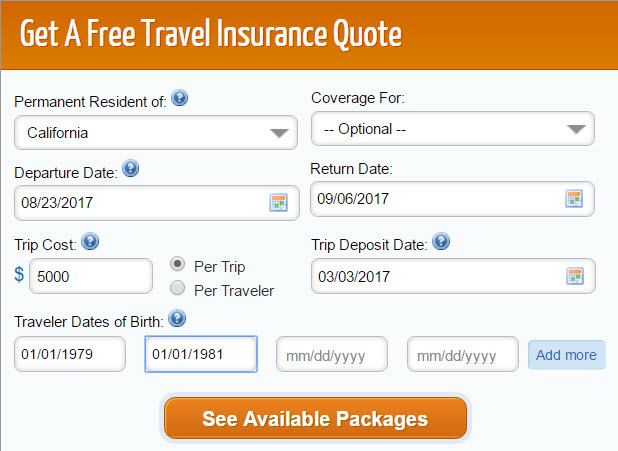 The total cost to insure my fictional trip is $368 ($230 plus the $138 Cancel for Any Reason upgrade). Simply click through, enter your personal and payment information and you’re done! I get it, $368 isn’t a small amount of money. To me the cost is worth it so I can plan trips without worrying that my pregnancy will put me out thousands in nonrefundable plane fares. I’d also rather spend the money instead of not traveling at all during pregnancy. I insure only the non-refundable portions of the trip. It brings the cost of the insurance down. There’s no reason to go through making an insurance claim on a refundable hotel reservation if I can simply call the hotel to cancel. If the trip cost goes up, I call and adjust the policy. I estimate how much coverage we need and buy the policy. If the non-refundable part of the trip costs more than anticipated, I call the insurance company and adjust. Please note I’m not an insurance agent and this is just my experience, not insurance advice. You should do your own research into insurance policies before buying. I am traveling to London for business soon! I wanted to go early in the pregnancy but it didn’t work out. 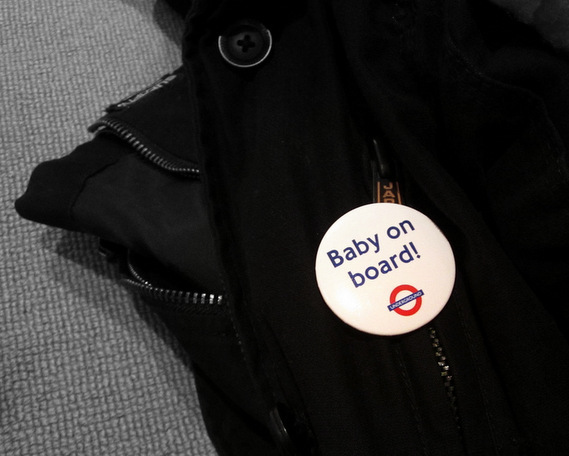 I’ll be taking off on a 10-hour flight just shy of 28 weeks (or 7 months along). Given the choice between flying while really pregnant or having to go later and leave a baby behind, I’m choosing the former. Assuming I can until I can’t. Just like with my trip to Australia, I’m assuming I can travel as normal unless my body or this baby tell me I can’t. I easily could have not scheduled the trip not knowing how I would feel. But what if the 28th week rolled around and I felt fine? Carefully reviewing the rules. Different airlines have different rules about how far into the pregnancy you can travel. Some require a doctor’s note after a certain point. My airline requires a note at 28 weeks. While I don’t technically need one on the way there, I will carry one. I recommend carrying one if you’re showing even if your entire trip will occur before the deadline — you never know what a gate agent will say. Insuring the trip and making cancellable reservations. All of my hotel reservations can be cancelled and refunded. I’ve insured the parts that are coming out of my pocket and not the company’s. 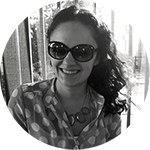 Pregnancy is a tricky thing and not covered by all travel insurance policies, especially if you are pregnant at the time you make the reservations. I’ve purchased a “cancel for any reason” policy which will allow me to stop the trip if I just don’t feel up to going. Mr. P is coming along. He’s not coming just because I’m pregnant, though I’m much happier to have him with me. We try and travel together always, even if one of us is on business if we can swing it. I’m glad he’ll be looking out for me! Being aware of my health coverage options if something goes wrong. Without getting into too much minutiae, I will be fine if I need medical care or emergency evacuation abroad. I’ll make sure and know what to do and where to go if I need help. Adjusting our leisure time. We’ll have two weekends to ourselves. In non-pregnant circumstances, we’d probably take two weekend trips as far as we could get. We’re still taking a trip one of the weekends, but it’s a bit less ambitious. Even if I’m a spry pregnant lady at that point, I’m sure I’ll be tired so it’s a good compromise. How will it turn out? I have no idea but I’m hopeful. I’ll keep you in the loop! Update: Read all about how the trip went here! Image courtesy Leon Brocard via Creative Commons license. I planned my album very carefully with emphasis on ease. 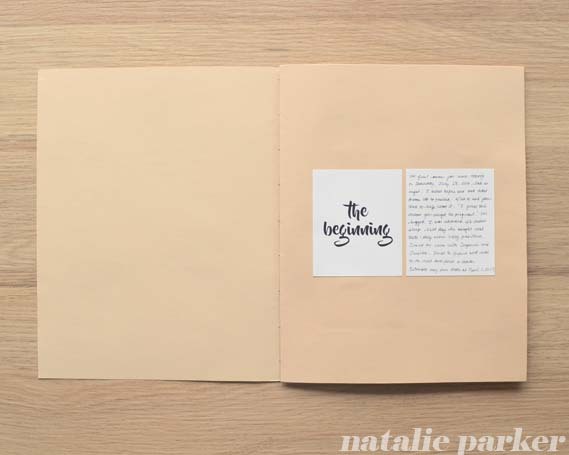 Here are how the pages came out so far! I left some blanks for the title page. 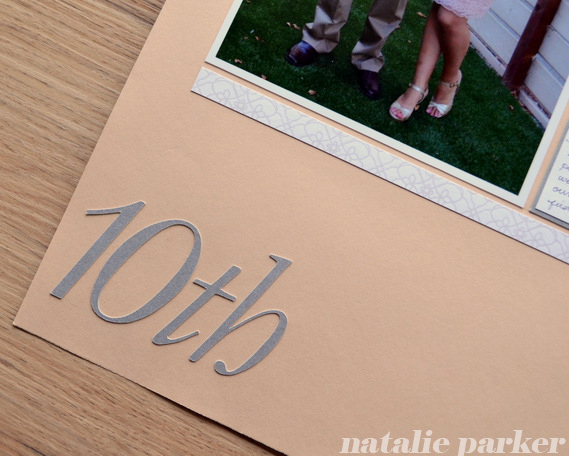 I think I’ll make that after the baby is born and when we have a name. 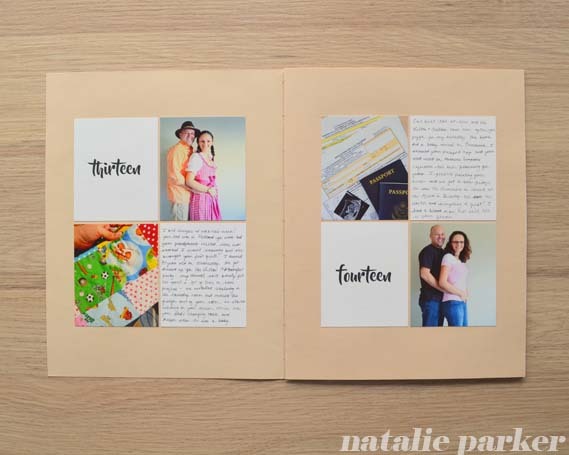 Week 4 was the official start of the pregnancy, but I wrote a beginning card just to talk about finding out we were pregnant. I designed the album in Week 6 and we didn’t start taking bump pictures until then. I used whatever I had for 4 and 5. In Week 6 my best friend’s daughter was born! Don’t ask about our Week 7 bump picture. It’s on a memory card that’s hiding somewhere in our house. I know that I’ll find it eventually. Maybe on the kid’s 18th birthday? I’m trying not to sweat it at this point. Week 7 is also when we left for Australia! I timed the bump pictures so we’d only have to get one on the road, which was Week 8. Nice blank wall in our hotel room! I balanced the camera on a couple coffee table books on top of the ironing board. We were in Australia for most of Week 9 but took the bump picture as soon as we got home. 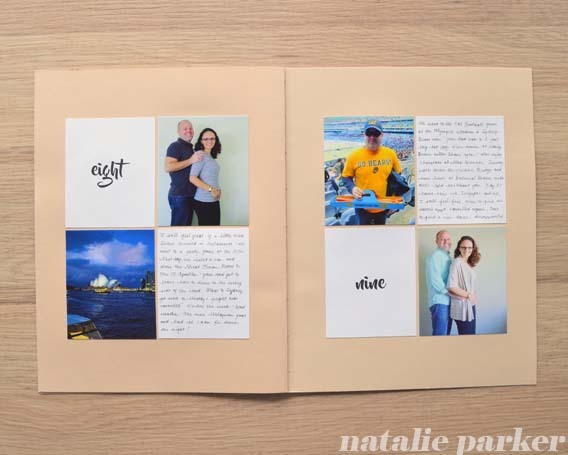 Other than in Week 8, the pictures don’t scream Australia, but this album is about the pregnancy and not about our trip. I’ll scrapbook the trip separately later. Notice I varied the layout week to week. 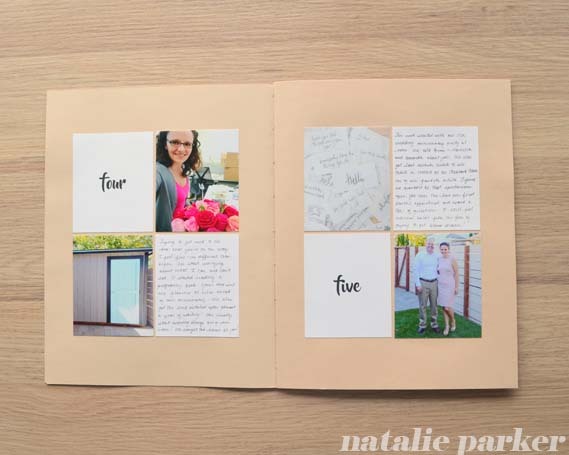 It looked too boring to have the cards in the same position when the pages were facing each other. 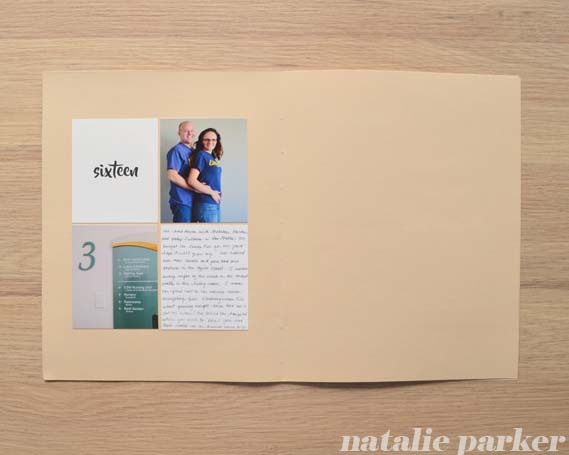 Week 11 featured a big big deal: the very first picture of our baby! I scanned it and printed it to size for the page. Week 12 we had another ultrasound and I realized I wanted the option to add big things. I didn’t want to plan for things outside of my formula because I didn’t want the pressure. But since the album size is flexible, I made a game time decision. The font is Klinic Slab Book and I pre-cut a ton of “weeks” and numbers out. 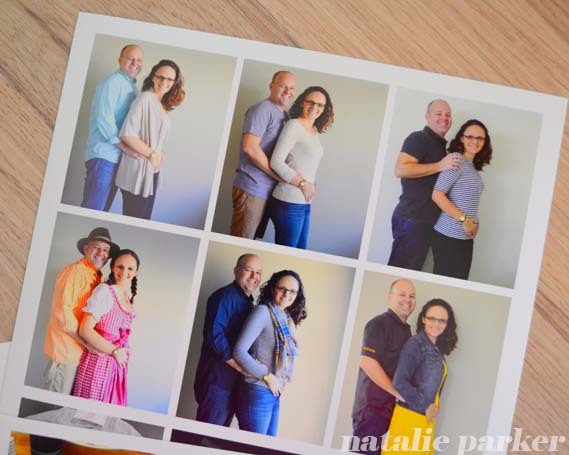 See what I mean about not wanting to wear the same outfit in each picture? Our Oktoberfest gear in Week 13 makes me smile. The baby also got its first quilt courtesy of my mom. 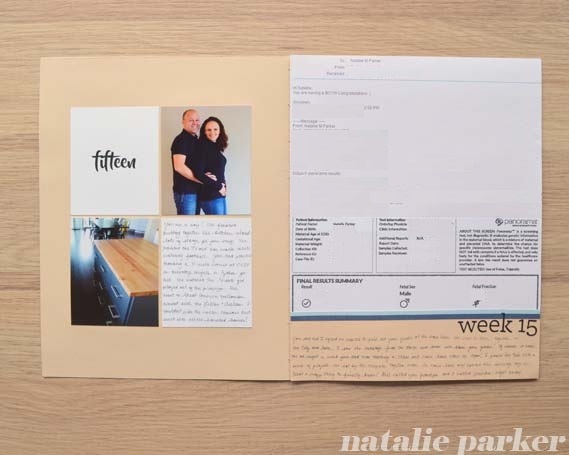 Good thing I came up with the full page option because in Week 15, we found out we are having a BOY. I printed the message from the doctor plus a piece of the test result (several sections below blurred for privacy). I’m glad I had the extra room to tell the story of how we found out. I’m loving how we are mixing life stuff, baby stuff, and house stuff in the pictures. In Week 16 we took our hospital tour (I was the only one who was sneaking pictures for my album). Well phew! So far so good! Even though the little guy is quite comfortable and is taking a while to pop out, I’m loving the weekly pictures! Well over ten years ago in Vegas, I wanted a gondola ride at the Venetian Hotel. Mr. P balked at the price and said that he’d pay for a real gondola ride when we made it to Italy. I was hopping and skipping when we finally arrived in Venice last year, ready for him to make good on his promise. Just like anything that’s mildly famous in a city, it’s worth knowing a bit before you buy. 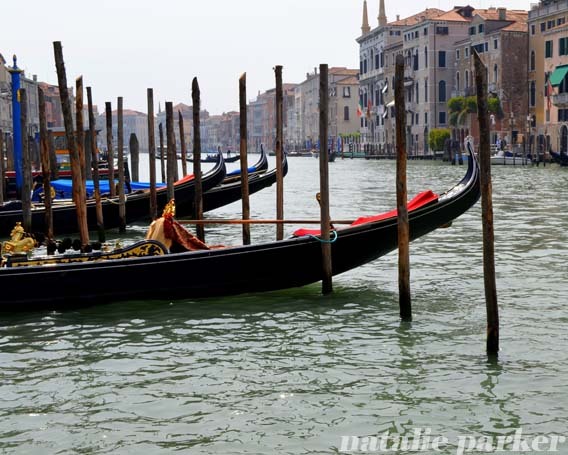 Here are my essential tips for having a great gondola experience! Rates are fixed. At the time we went, it was 80€ for 30 minutes. The price was the same for two to six people. If you want to save, split it among a group. If you have a group, note there are only two traditional seats in the gondola. The others will be sitting on small footstools. Rides at dusk cost more. Yes, they speak English. 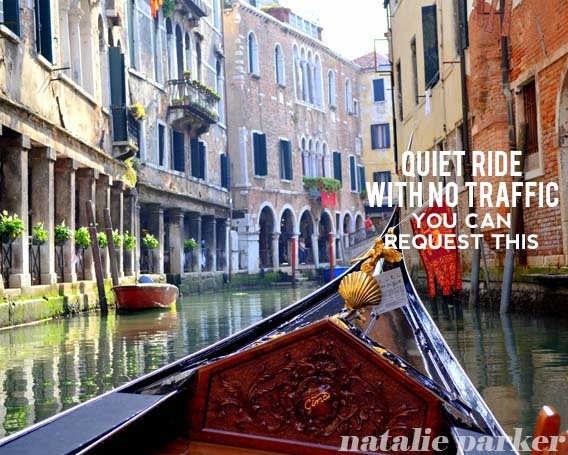 Gondoliers speak well-enough English to quote you the price, sell you the ride, and understand the below. Don’t worry! Watch the clock. Even though rates are fixed, look at your watch to make sure you are getting the entire time you paid for. To avoid an argument, make a big show of looking at your watch as you climb in. Singing costs extra. If you want a serenade by your gondolier, you will pay extra. Gondola vs. Sandalo. 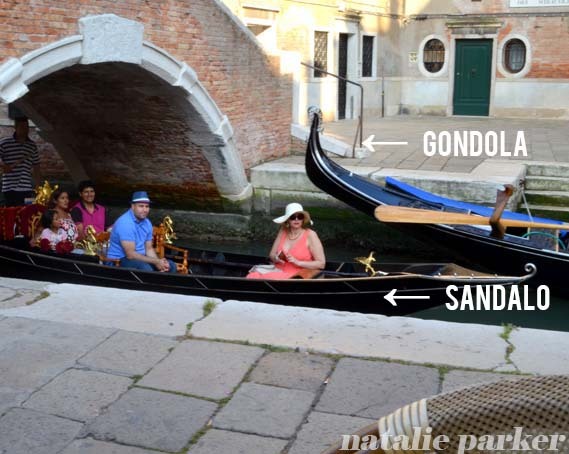 Make sure you are riding a gondola and not a sandalo if you want a gondola ride. A sandalo is a smaller boat that can fit into tighter canals, which can be a good thing if that’s what you’re after. But if you’re after a ride in a gondola, make sure you know the difference in looks. 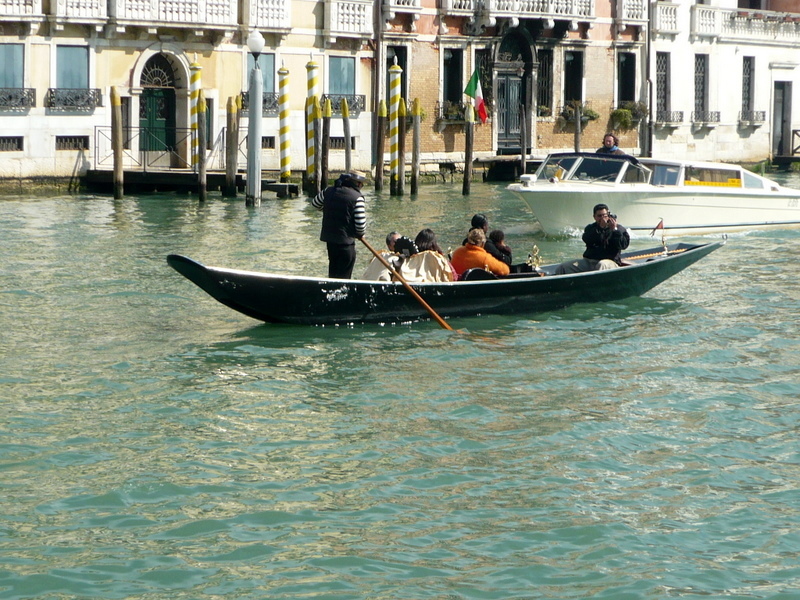 A gondola looks like this (note tall ends) and a sandalo looks like this. 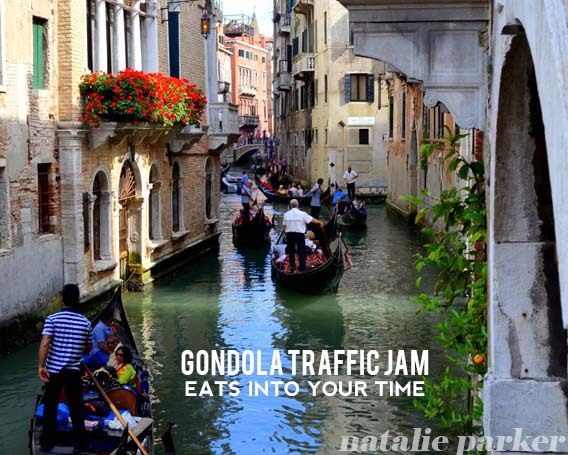 Gondola traffic jams eat into your time. Your time is fixed even if your gondola has to wait for 3 or 4 other gondolas to clear out of your path. 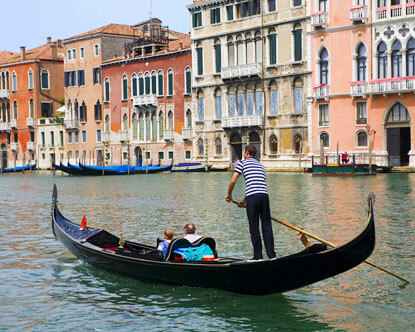 Do not get a gondola near San Marco or from the touristy side of the Rialto Bridge. We got ours from Rialto Mercato on the other side of the bridge. We told the guy we wanted quiet after seeing groups of cruise passengers stuffed up in other canals. He listened and we had a wonderful time. 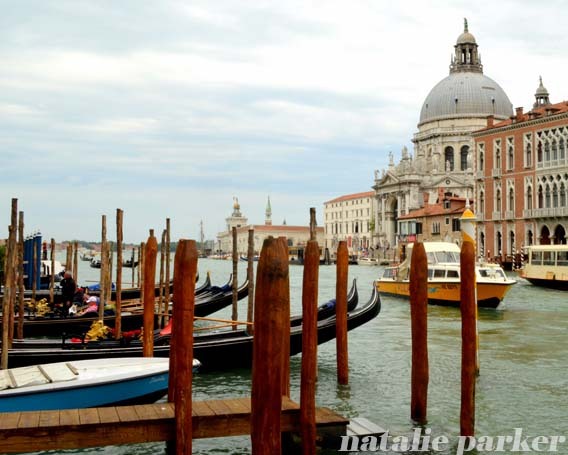 Gondoliers will point out sites. It’s sort of like a mini tour. Since we asked for a quiet trip, we saw some cute cafes out of the way that we were able to find our way back to after the ride. They will take your picture. I think they’re pretty used to it! Don’t save your gondola ride for the last day. Or save it really at all. You never know how the weather can change. If the weather is great, go for it! If you really want to put off the ride, make sure to check the weather online. If the weather is bad, no gondola rides. We were there for 2 days: the first day was sunny and the second day was drizzly and windy. If we waited til the second day, we would not have gotten a ride. Anyone else have tips to share? 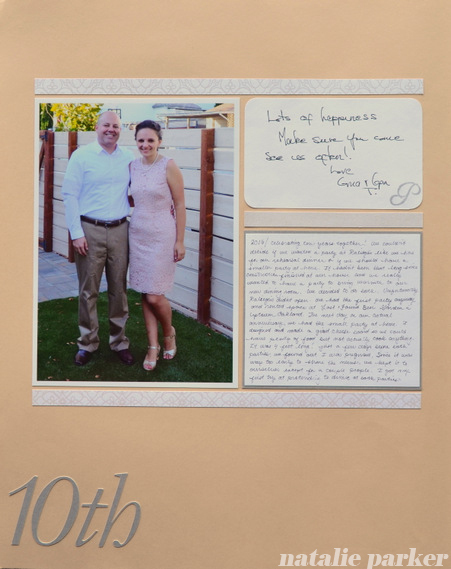 We loved our experience! Want more travel advice? Check out an index of all my travel posts here! Notice something in the weekly bump pictures? Other than the noticeable lack of a bump for a long period of time? Kid is going to do what the kid wants to do. Moving on. That’s my husband and he’s in every weekly bump picture. I love weekly bump pictures. Love love love. It’s such a cool way to show the progression of time. 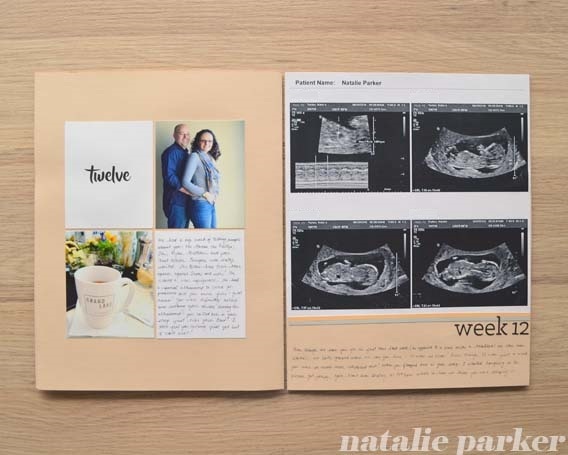 When I was researching other pregnancy albums, I knew a weekly picture was totally going to happen. 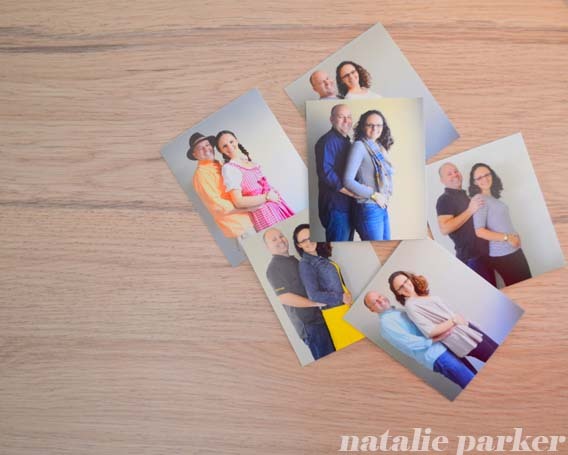 One thing that struck me: looking at the weekly progression, dad seemed very absent. Sure, in some people’s lives, dad might not be available. For me, I didn’t want my album to be all about me. This is about us. 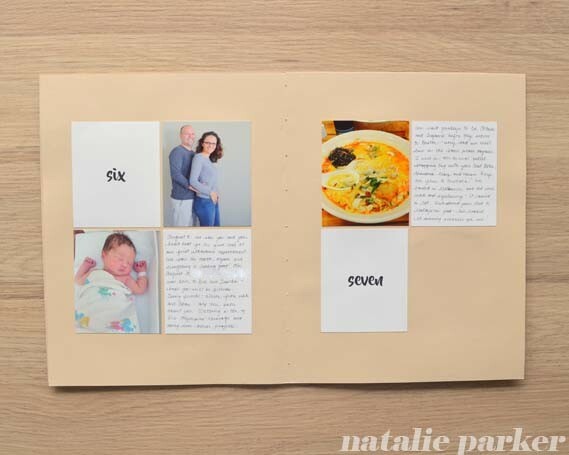 The album is from my perspective but this experience is about us becoming parents. We’ve been handling everything together aside from him not actually growing the baby. It’s important to me that when our kid looks at the album, dad is very prominent. We have it down to a science now and Mr. P is a very good sport. We use the same blank wall in our living room and he knows exactly where to stand. And I don’t have to wait for him to fix his hair or makeup. I get as much natural light as I can. As I said earlier, we don’t get a picture on a set day of the week. I try to get it when we’re both home and have the best light. If that means that weeks 17 and 18 are only two days apart, so be it. We use a tripod with my DSLR. We used a timer for the first several weeks, then I got a remote which made it much simpler. I tilt the LCD screen so I can see it from our spot and know if I need to move a hand or un-slouch. The whole process takes about 10 minutes. This is from setup to take down. I keep the tripod in the closet half-extended so it’s easy to set up. We don’t have set outfits. I do love the weekly bump pictures where mom is wearing the same or similar black dress the entire time. I opted not to. I didn’t want to have to change my clothes. I also thought it’d be cool to see my clothes and seasons change. A big bonus would be to show clothes from things we were doing at the time, like going to football games or an Oktoberfest party. As with everything in pregnancy, to each his or her own. For us, it’ll be nice for our child to look back and see how excited we both were (and how we both used to look when we got full nights of sleep). We travel a lot. I’m pregnant. How is that going to shake out? I have no idea. We’re making the choices that we can with the information we have. We were in Australia during Weeks 7-9 of the pregnancy. That’s not exactly a hop on Southwest from SF to LA so let’s talk about it. 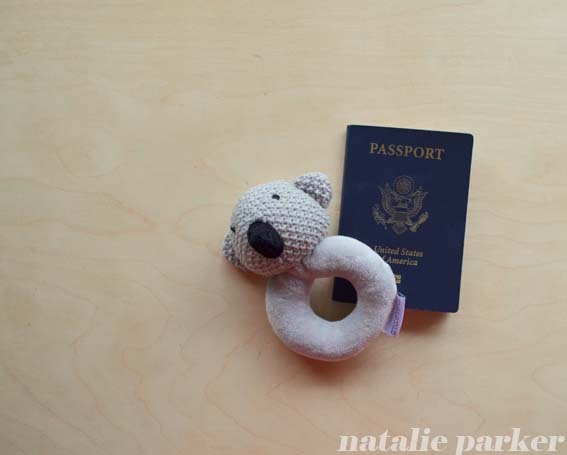 I wasn’t pregnant when we planned the trip, but we knew it would be a possibility. We decided to make the plans anyway. We used a bunch of American Airlines miles to get business class seats to Sydney. I figured that if I was pregnant, I’d at least be comfortable in those seats. What if I felt sick? What if it just wouldn’t work? It was all possible. I decided to not to assume I couldn’t do things. Instead of not making the plans in the absence of information, we made the plans and decided we’d adjust if we needed to. I’m assuming I can do things (maybe with some adjustments) unless my doctor and/or body tell me I can’t. Doctor’s advice. We got to a doctor right quick and got her advice. 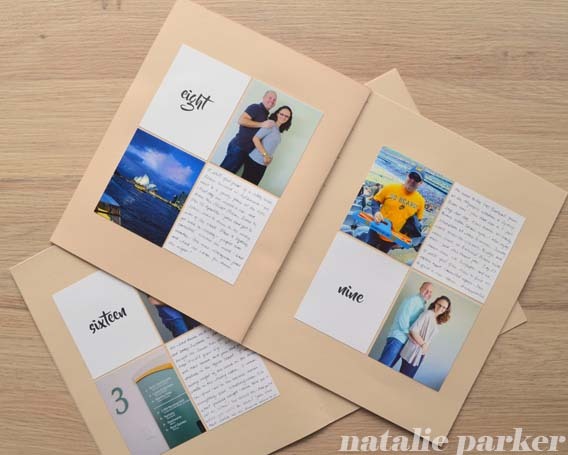 I was worried about a ton of stuff including the possibility of nausea (morning sickness). Handily, if it hadn’t started yet, it would start at the latest in the middle of our 14-hour flight. Awesome. Nausea remedies. I brought a pack of every nausea remedy known to man in my carry-on just in case. How Did the Flight Go? In the end, everything was fine! When we landed in Melbourne (SFO-LAX-SYD-MEL), I practically skipped out of the airport because I was so proud of myself. Staying hydrated and circulating. The fear of God was put into me about staying hydrated on the plane and keeping up my circulation. I HATE moving around on planes because flying scares me. Drinking a ton of water fixed all of that because I was up and down to the bathroom all. the. time. Sleeping and eating. Having the business class seat helped because I was able to lie down and sleep for several hours. I had no issues running out of food because we were fed constantly. Being the weirdo turning down the free booze. I didn’t feel the need to disclose my pregnancy to the flight attendants, but I’m pretty sure they thought I was a weirdo. No thank you, I don’t need an endless supply of wine. No thank you, I don’t drink coffee (I don’t). Please bring me water with this fancy dinner. I ended up with zero nausea but got really tired. I got tired really early in the evening during the trip, which is normal. Mr. P loves going to bed early and my fatigue forced us to take it easy. I’m a big fan of that! Pregnancy is a good excuse for me to rest. On earlier trips, I’d feel guilty about lazing in the hotel room thinking I wasn’t getting enough out of my time. I packed my workout gear. I almost never have room for workout clothes in my suitcase but the baby has priorities. I packed it and made sure to stay active whether it was walks or some time in the hotel gym. What I’m allowed to eat. Being newly pregnant, I was hyper-paranoid about what I was eating. Australia’s not a bad place to be because the food is relatively safe. I only had one hormone-induced-cry at the Melbourne airport when our flight was cancelled and there were almost zero healthy food choices I could eat. So far, so good. Am I letting my blissful ignorance guide me? Perhaps. Am I glad I had an excuse to purchase an adorable koala rattle? You bet.